with Lefevre Gallery, London, where purchased by the present owner in October 1977. Exhibition catalogue, A Memorial Exhibition of Paintings & Drawings by L.S. Lowry R.A., London, Lefevre Gallery, 1976, no. 14, illustrated. Exhibition catalogue, L.S. Lowry, London, Royal Academy, 1976, p. 79, no. 195, as 'A Country Road', illustrated. D. McLean, L.S. Lowry, London, 1978, p. 12, illustrated. and London, Tate Gallery, November 1966 - January 1967. London, Lefevre Gallery, A Memorial Exhibition of Paintings & Drawings by L.S. Lowry R.A., May - July 1976, no. 14. London, Royal Academy, L.S. 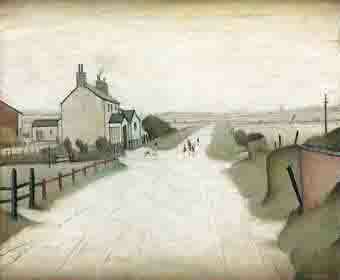 Lowry, September - November 1976, no. 195, as 'A Country Road'.